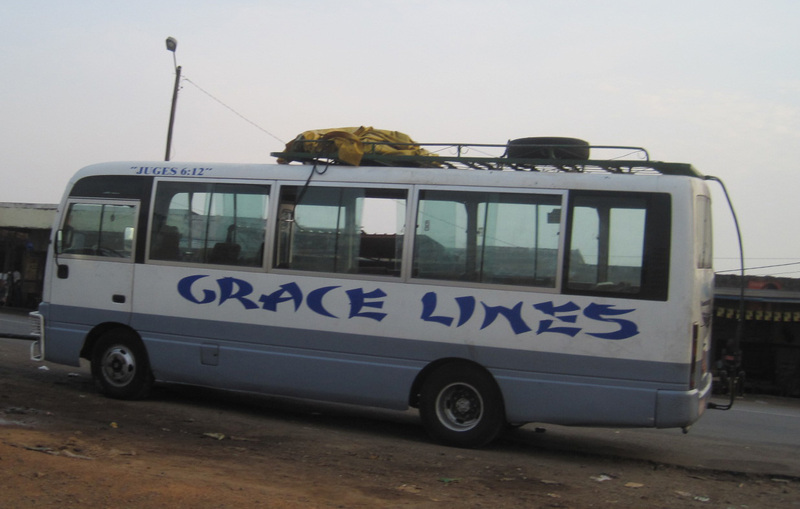 A bus in Accra has a wooden body, its roof resting on four posts. Because there are open walls, a pleasant breeze cools the ride. In this climate, the value of a breeze is never to be taken for granted. In the Sahara, the palaces of rulers have the most ingenious constructions—full of chinks, crannies, winding passageways, and corridors so conceived and constructed as to maximize cross-ventilation. In the afternoon heat, the ruler reclines on a mat optimally positioned to catch this refreshing current, which he breathes with delight. A breeze is a financially measurable commodity: the most expensive houses are built where the breeze is best. Still air has no value; it has only to move, however, and then immediately acquires a price. The buses are brightly ornamented, colorfully painted. On the cabs and along the sides, crocodiles bare their sharp teeth, snakes stretch ready to attack, and flocks of peacocks frolic in trees, while antelope race through the savannah pursued by a lion. Birds are everywhere, as well as garlands, bouquets of flowers. It’s kitsch, but full of imagination and life. The inscriptions are most important of all. The words, adorned with flowers, are large and legible from afar, meant to offer important encouragements or warnings. They have to do with God, mankind, guilt, taboos…. Every now and then our bus stops along the side of the road. Someone wants to get off. If it’s a young woman with a child or two (a young woman without a child is a rare sight), there unfolds a scene of extraordinary agility and grace. First, the woman will secure the child to her body with a calico scarf (her small charge sleeping the entire time, not reacting). Next, she will squat down and place the bowl from which she is never separated, full of food and goods of all kinds, on her head. Then, straightening up, she will execute that maneuver of a tightrope walker taking his first step above the abyss: carefully, she finds her equilibrium. With her left hand she now clutches a woven sleeping mat, and with her right the hand of a second child. And this way—stepping at once with a very smooth, even gait—they enter a forest path leading to a world I do not know and perhaps will never understand. I think I could one up that one.